Always There by Timothy P. Schmalz is a Christian sculpture that serves as a reminder that Jesus will never leave us nor forsake us. It would make a wonderful encouragement gift while fitting well into any home decor setting. 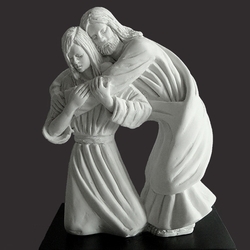 Jesus comforts a young woman with a tender embrace showing us all that we are never alone. This solid resin-stone cast is left in its natural Carrara white color and is mounted on a solid matt black base. Timothy personally sculpts every original small masterpiece complete with his signature or monogram. Each replica is detailed by hand to the exacting standards of this modern day master sculptor.